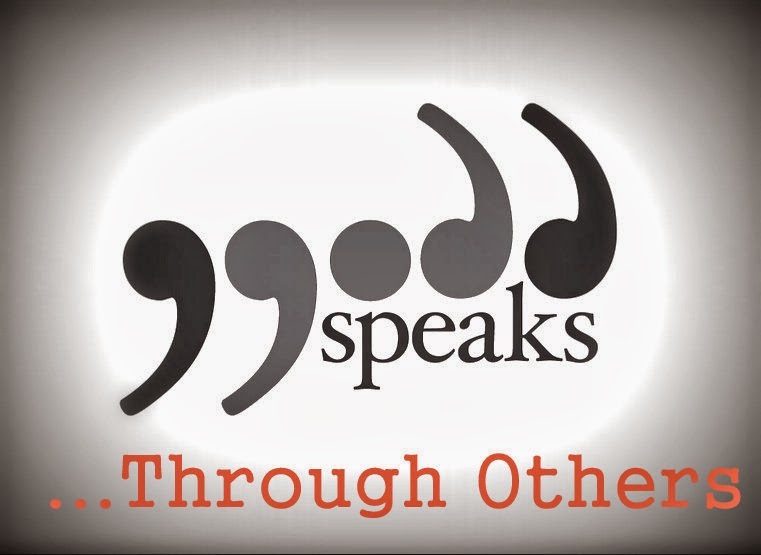 Welcome to the third part of a new series that I'm calling "God Speaks..."
God puts people around us because he knows it's not good for 'mankind to be alone'. He knows we need companionship, friendship and someone to talk to. Yes we need our own space, but we were made for relationship. And one of the key reasons why is that God will often speak to us through those that are around us. Sometimes in a not so obvious way - at least to the other person. Sometimes directly through the other person. So in this post, I want to look at the vital role that someone else plays in hearing God for you. 13 Now in the church at Antioch there were prophets and teachers: Barnabas, Simeon called Niger, Lucius of Cyrene, Manaen (who had been brought up with Herod the tetrarch) and Saul. While they were worshiping the Lord and fasting, the Holy Spirit said, “Set apart for me Barnabas and Saul for the work to which I have called them.” So after they had fasted and prayed, they placed their hands on them and sent them off. Whatever the channel, it's God who speaks to us, through the Holy Spirit. We know that, of course. In the passage above from Acts, it's in a group setting (though Barnabus and Saul/Paul were also present) where God makes it known, through the group, that He wants these two men set apart for the work that He is calling them into. From this, and from my own experience, we see two common principles at work - firstly, it's good for others to hear from God for us. Secondly, it will confirm and fit with what we ourselves are feeling. I would be very cautious if I was speaking with someone and they told me someone brought a word over them that cut across everything they felt or were doing, and didn't fit with anything else God has said about them - even contradicts it. Because of this (and I'm not saying the above situation cannot be God speaking!) I would go as far as to say, if this happens to you, you are well within your rights to note it (let's not treat prophecy with contempt) but shelve it, until maybe something further comes. Ultimately, if it is God and you haven't gotten the message the first time round, He'll let you know again...and again. He is God, after all. If something comes from 'left field', and from a source you are not totally familiar with, you are right to weigh it carefully and wait on God. But when something comes that confirms what God has said to you, or comes from three or more unrelated sources saying the same thing, then you had best get on with what God is saying to you! The golden rule for bringing words over others (and the same applies for you receiving them as well) is to ask - is it Encouraging, Comforting, Strengthening? This is especially true for when you are just learning to grow in this gifting. For that reason, don't look to bring directional words to early. What I mean by a direction word is anything about who someone will marry, maybe life moves or situations, dates etc. You get the idea. A recent example to highlight this was the three prophetic words that came out BEFORE October 3rd seemingly confirming that San Francisco was about to be destroyed by the worlds most powerful earthquake ever recorded. On the surface of things, it seemed they added up - three sources (check!) saying the same thing (check!) from reputedly seasoned people who'd had a proven track record (check!). And yet it would seem the words were confirming a destructive, hate filled God was bringing his judgement and annihilation to Northern California as punishment for something. But this doesn't sound like the loving God of the Bible that I personally know. And so it proved. Granted, had I been in San Francisco that day, having read what I read, I think I honestly would have found things to do somewhere else - say New York. But chatting it through with a friend, who spent a lot of time in California and loves the city of San Francisco, he opened my eyes to the continued sense of words that seemingly confirm California is doomed, and yet contrasts that with the character of God. Such a destructive word is neither encouraging, comforting nor strengthening! In Tallinn, we're seeing the encouraging beginnings of a growing prophetic culture within the core team of the church plant. Every time there is a visitor with us, we make time to pray for them, to bring prophetic words and speak God's blessing over them. It's great hearing the guys and girls speaking words over people they don't know, but I do, and how spot on these words are! This is what we love to do! Two key words were spoken over me early on in my life, one confirming the other, with each having a very profound impact on me. These were by Gerald Coates and Andrew Davies and if you click on their name you see a little as to why. Both took the risk in bringing a word over a stranger. Both actually dared to talk about times. Interestingly enough, when Gerald brought his word over the then 17 year old young man I was, it was mainly about 17 years time from then - over the 34 year old self that now writes this post. So I am particularly interested in why this year of all is any different from the rest. I guess we wait and see! Crucially, both were encouraging and very shaping. They brought release and growth, as well as a personal awareness of God himself working in me - He is after all the personal God! What might have been a distant, far away 'relationship' was suddenly made powerfully alive and very personal. And that is why God often speaks through others. If this is not your experience, maybe you need to change churches. If you can make it over to Tallinn, come and hang out with us one Sunday and let the team speak destiny into your life!